Try Mary Berry’s take on this retro classic. For special occasions sprinkle the sponge with a cherry or orange liqueur before spreading with the jam. For the vanilla ice cream, pour the cream and milk into a heavy-based saucepan. Split the vanilla pod lengthways and scrape out the seeds; then add the seeds and pod to the pan. Heat the mixture until just below boiling point. Remove the pan from the heat and set aside to cool for one hour to allow the vanilla flavour to infuse into the mixture. Remove the vanilla pod and discard. Whisk the egg yolks and sugar in a bowl until pale and thickened. Slowly whisk in about one-quarter of the cream mixture. Reheat the remaining cream mixture until just boiling, then slowly whisk it into the egg mixture. Pour the egg mixture into a clean saucepan and cook over a gentle heat, stirring continuously until the custard thickens enough to coat the back of a spoon – it must not boil. Pour the custard into a bowl and set aside to cool, then cover and chill in the fridge overnight. Pour the cooled custard into an ice cream machine and churn according to the manufacturer's instructions, until thick and smooth. Spoon into a freezer container and freeze until needed. 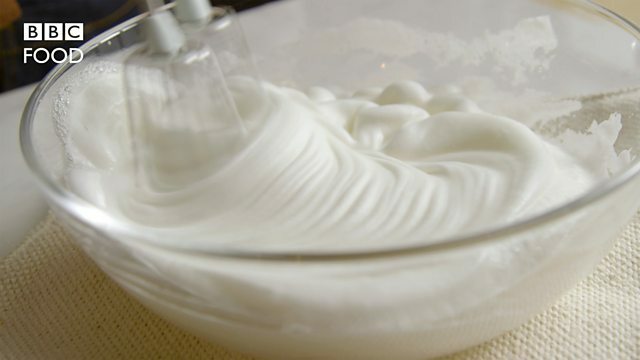 For the meringue, whisk the egg whites in a clean, large bowl until stiff peaks form when the whisk is removed. Slowly whisk in the sugar, whisking well between each addition. Continue to whisk until glossy and very stiff peaks form when the whisk is removed. To assemble the Alaska, spread the jam over the circle of sponge cake, then arrange scoops of ice cream in a pyramid shape on top, leaving a 1.5cm/½in border. Spoon the meringue all over the ice cream, ensuring there are no gaps, and use the back of a spoon to make a swirl pattern. The baked Alaska can now be frozen until needed. To cook the baked Alaska, preheat the oven to 200C/400F/Gas 6 and bake for 8-10 minutes, or until golden-brown all over. 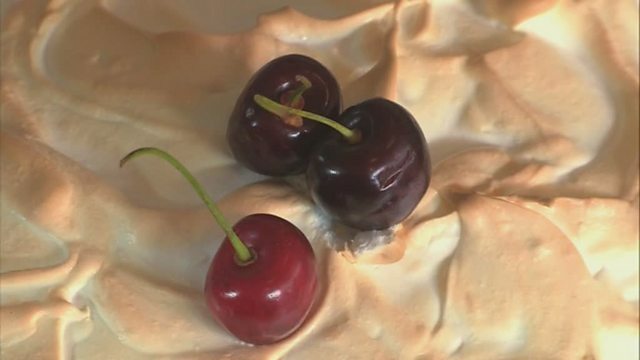 It is essential to assemble the baked Alaska quickly once you have made the meringue. The ice cream scoops can be laid out on greaseproof paper on a tray in the freezer ready to assemble on the sponge.